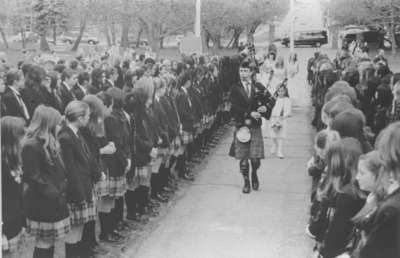 This is a black and white photograph of a piper leading the May Court Procession at the Centennial May Court Festival at Trafalgar Castle School. The piper is Dave McGonigal. Piper leading May Court Procession at Trafalgar Castle School, May 12, 2007, Carl Ferencz. Whitby Archives 23-000-392.